My family love crostinis. They are perfectly bite-sized and have endless possibility for toppings. 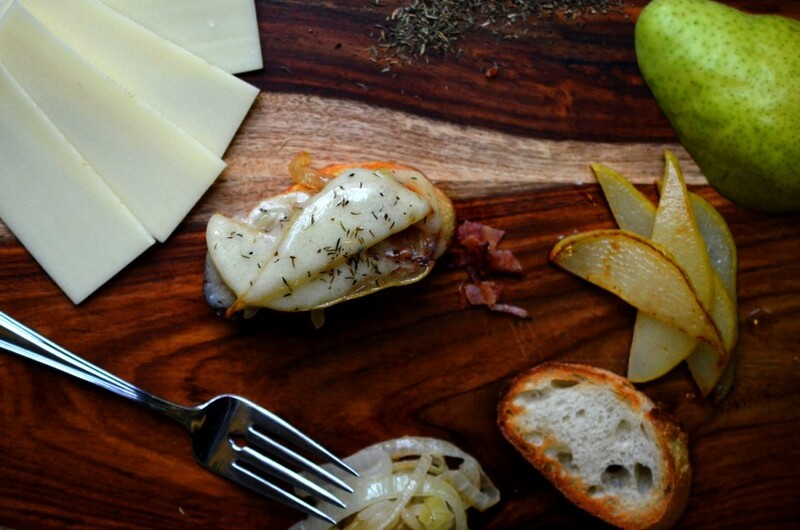 These Sauteed Onion, Pear and Bacon Crostinis are a lovely balance of salty, sweet and savory flavours. All of the individual pieces of this can be pre-made and assembled just before serving. In a large skillet, melt 2 tbs butter on medium-low heat. Add sugar, salt and onions. Cook, stirring frequently, until onions are translucent, about 10 mins. Do not let the onions become crispy. Set aside. In another large skillet, melt the remaining 2 tbs butter on medium heat. Add the pears and sauté, stirring occasionally, until soft and slightly browned, remove from heat. Layer each crostini with a layer of caramelized onions, about 1/2 tsp bacon, a sprinkle of thyme, and two slices of pear. Top with a slice of gruyere. Place assembled crostinis on a baking sheet and broil until the cheese has melted. Let cool slightly and serve.